Oregon State University's new Portland Center has found a home on the second floor of the historic downtown building. While Oregon State University has long had a presence in Portland, its classes and programs have been scattered in buildings around the city. 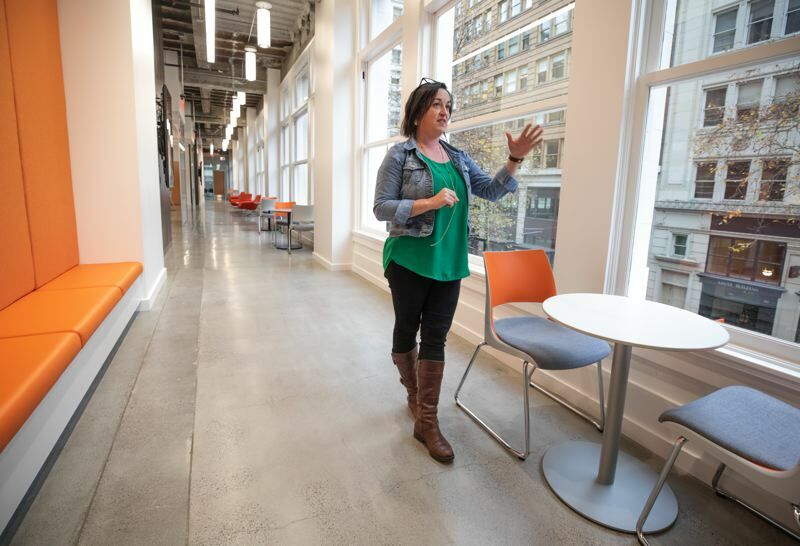 With the September opening of the OSU Portland Center, many of those programs are now being brought together under one historic roof, on the second floor of the Meier & Frank Building in downtown Portland. While the center serves as the offices of the OSU Foundation and Alumni Association, it also is bringing together the traditional classroom and E-learning options that the university is already known for and combining them in a new way. The OSU hybrid degree program, which the center is offering at both the undergraduate and graduate levels, is the result of market research the university conducted. That research indicated that a growing number of learners in the Portland area want to be able to pursue a combination of ways to earn credits and obtain degrees, Steve Clark, OSU's vice president of university relations and marketing, said. Aimed at non-traditional students such as single parents or people who work jobs that don't allow the flexibility to take classes during regular daytime hours, the Portland Center's hybrid degree programs in psychology, business administration, and human development and family sciences allow students to tackle online coursework at times that fit with their individual schedules and lives. Once or twice a week, often during evenings or on weekends, students come to the center to engage in more traditional classroom experiences and work with other students on collaborative projects. SERA Architects and Turner Construction to transform the space from its former life as a Macy's department store into a representation of the next generation in education. The original design of the Meier & Frank building, which was constructed in phases from 1909 to 1932, included abundant windows that allowed daylight to fill the space. However, when Macy's moved into the building in 2008, the store had a wall installed around the perimeter of the second floor to create an intimate shopping experience for customers. The space between the wall and the windows was used to store inventory as well as for offices for the store's security department. For the project team, removing that wall to open up the second-floor space was one of the first orders of business. The difference was like night and day, according to Eric Philps, SERA's project designer. "Just being able to see across that floor plate, the light from the windows was amazing," he said. "It was really nice to see the building go back to its original configuration." Because the Meier & Frank Building is on the National Register of Historic Places, designers weren't able to do much to the outside of the building. Instead, they focused on the interior and used the windows as a way to bring the second-floor location to the attention of passersby on the street. Classrooms and offices were moved to the interior of the space. Common areas, where students mingle before and after classes, were situated in areas near the windows. 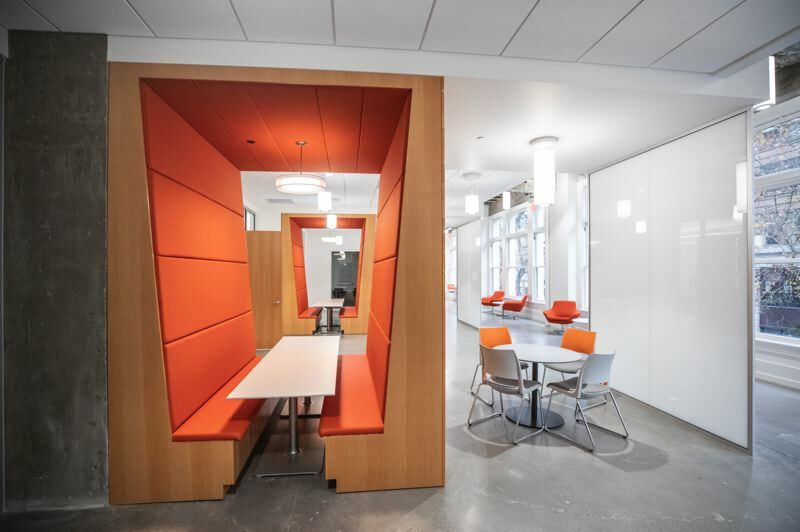 Along the Morrison Street side of the second floor, for example, each window features a table with two or three orange-backed chairs where students can relax between classes or work on projects together. Another window-blessed area, a section of the main lobby that overlooks Pioneer Courthouse Square, has become a favorite of the center's staff. Sara Knott, the center's operations manager, said it's common to find employees seated on the orange cushioned benches near those windows, enjoying lunch and people watching. While the windows offer a view into the center during the day, it's in the evening and at night — when many classes are being held — that the space really connects with people below. "At night, it's really cool that all of the Oregon State signs [inside] are so bright, you can see them from the street," Knott said. When it comes to OSU's signature color, all shades of orange are not created equal. The surfaces of the reception desk in the main lobby, for example, currently are plain white because the orange wrap that will eventually cover it is a specific shade — what the project's designers call "OSU orange" — that has taken a little more time to obtain, Knott said. Philps understands the attention to such a detail. He's been involved in a more than a few upper education projects during his architecture career. Logos and colors are always a major focus of discussions in the design phase, he said. For Philps and his team, playing to that signature color helped determine the materials they tapped for the interior. 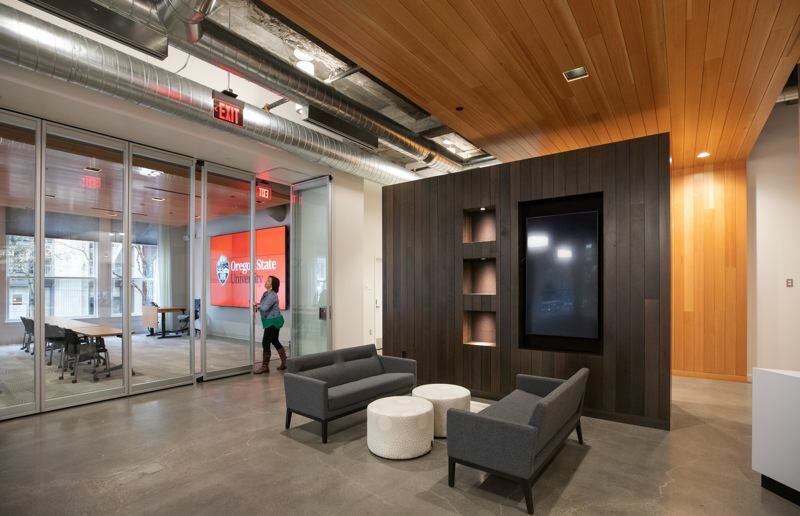 Doug fir ceilings throughout the building, for example, created a warmth and offered tones that meshed with the OSU orange. Other orange-toned interior accents were more of a happy coincidence, though. The metal pans on some parts of the ceiling, remnants of the construction method used on the original building, sport a natural reddish-orange cast that add yet another layer to a palette based on the OSU orange. 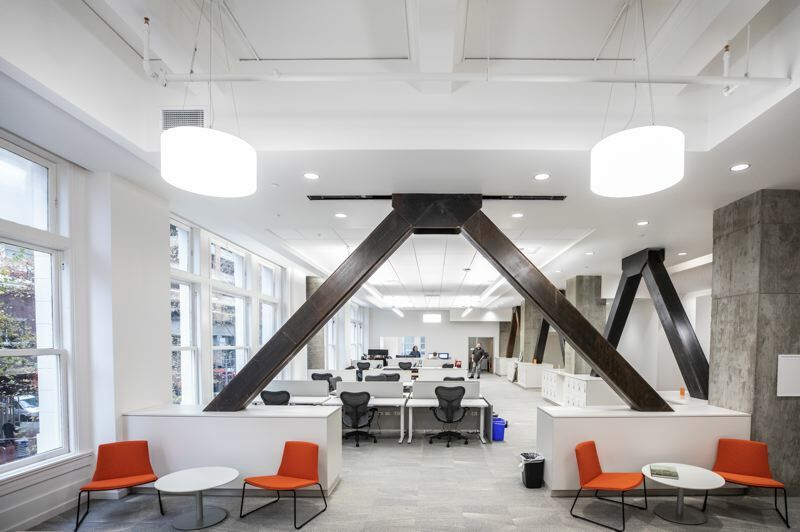 Even the damper frames — beams that were used to bring the building up to current seismic codes during a renovation just before Macy's moved in — feature rust-toned streaks. The project team decided to leave them exposed. "The color worked really well with the OSU orange and the Doug fir," Philps said. "We took advantage of that historic character the building had to offer." 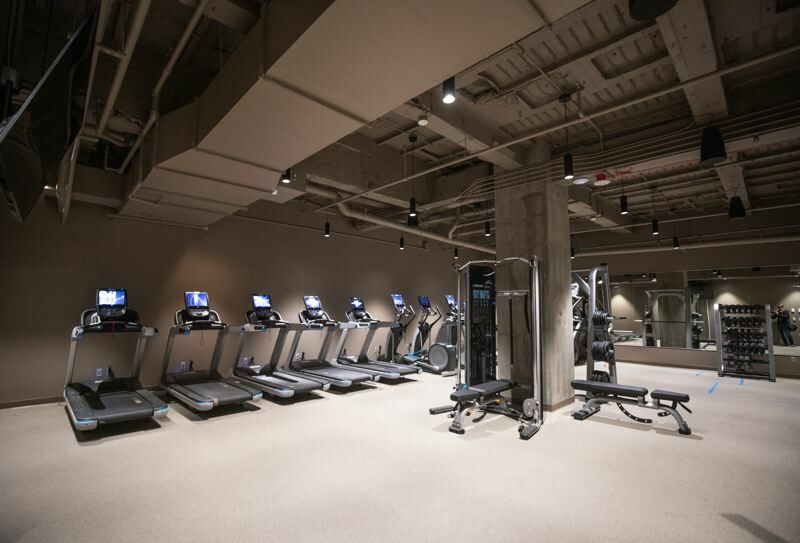 The historic nature of the building also created challenges for Turner Construction, the project's general contractor, and its subcontractors. The building as it exists today is actually three buildings that were constructed at different times. The original Meier & Frank store sat on half of the block where the building is located. A second building, on another quarter of the block, was constructed in 1915. The third building, which filled the last remaining open quarter of the block, rose in 1932. "Through the years, all three were combined ... [but] each historic building had its own structure," Brodie Bricker, Turner's project superintendent, said. "Depending on which part of the building you were working in, you had to use a different attachment." The building's inclusion on the National Register of Historic Places also required the construction team to preserve certain original aspects of the structure, including areas around the windows and doors. A team of plasterers was even brought in to restore original plaster work. "We had to restore quite a bit of the ceiling plaster and molding in ways that were [historically accurate]," Bricker said. Adding to the pressure was the project's tight timeline of just five months. Crews began working in May and had to finish in September, in time for the center's first students to begin classes. Bricker gave the tradesmen who worked on the project the bulk of the credit for hitting that end target. "They worked well together to deliver a great product in a short amount of time," he said. One of the most impressive aspects of the quick-turnaround project, according to Bricker, was the installation of the tongue-in-groove Doug fir ceilings, which were custom-made and built in place. "Each of the ceilings is quite an impressive chunk of work," he said. In addition to undergraduate degrees, the center will offer a hybrid master's degree in business administration as well as a graduate certificate in business development and a roster of continuing education and professional development courses (OSU's Food Innovation Center will remain in its current Naito Parkway location while the School of Pharmacy will continue to reside the Collaborative Life Sciences Building). The second floor space also can double as an event center. The concept of the space as a multiple-use area becomes apparent when Knott, the operations manager, walks over to a stretch of glass wall that separates a classroom from the general lobby area. Closer inspection reveals the single wall is actually a series of vertical glass slats. With what appears to be minimal effort, Knott pulls the edge of one slat toward her and then pushes the panel along a track until it lies flat against the wall. Additional glass sections are pulled out and then slid along the track until the side of the classroom is entirely open, becoming an extension of the lobby. The arrangement has already proven to work extremely well for accommodating large groups, Knott said. The combination lobby and classroom space has been put to use for a grand opening for the center as well as a women's leadership event. increases. The ways the space at the Center will change in use over time also is a work in progress, according to Knott. "I think organically it will grow into what it's supposed to be," Knott said. "The really cool thing is, we have the opportunity to help create that."